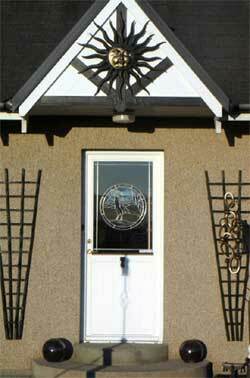 The Standing Gables Bed and Breakfast is located at Greenford in Inverurie. Check room availability using the search box on your right. There are three rooms offering a range of facilities to suit everybody. The Bennachie Room is the luxurious double room with a stunning view of Bennachie in all its glory. Room 2 is a spacious twin room while Room 3 has a more intimate atmosphere. All rooms are close to the bathroom where there are toilet, bath and shower facilities. There is a lounge for guests to relax in pleasant surroundings with a real coal fire and a stunning view of Bennachie. The guest house is great value for money and features a beautiful outdoor area with some truly exceptional scenery.